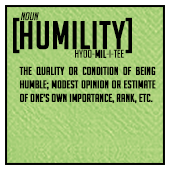 Humility is a modest or low view of one’s importance. It can be defined, theologically, as putting oneself below that of God – and 0f others. The following passages outline how important humility is, and how we can be humble. All passages are from ESV. 14 If I then, your Lord and Teacher, have washed your feet, you also ought to wash one another’s feet. 15 For I have given you an example, that you also should do just as I have done to you. 16 Truly, truly, I say to you, a servant is not greater than his master, nor is a messenger greater than the one who sent him. 5 On behalf of this man I will boast, but on my own behalf I will not boast, except of my weaknesses— 6 though if I should wish to boast, I would not be a fool, for I would be speaking the truth; but I refrain from it, so that no one may think more of me than he sees in me or hears from me. 7 So to keep me from becoming conceited because of the surpassing greatness of the revelations, a thorn was given me in the flesh, a messenger of Satan to harass me, to keep me from becoming conceited. 8 Three times I pleaded with the Lord about this, that it should leave me. 9 But he said to me, “My grace is sufficient for you, for my power is made perfect in weakness.” Therefore I will boast all the more gladly of my weaknesses, so that the power of Christ may rest upon me. 10 For the sake of Christ, then, I am content with weaknesses, insults, hardships, persecutions, and calamities. For when I am weak, then I am strong. 11 I have been a fool! You forced me to it, for I ought to have been commended by you. For I was not at all inferior to these super-apostles, even though I am nothing. 12 The signs of a true apostle were performed among you with utmost patience, with signs and wonders and mighty works.